Adare’s sylvan splendour remains a treasure. Mention Adare Manor in golfing circles these days and you will hear of the bid for the 2026 Ryder Cup at JP McManus’ beautifully restored golfing resort on the banks of the River Maigue, The Golf Course at Adare Manor. The original club remains where it has always been on the north bank of the river in one of the most privileged settings you are likely to find anywhere in the world. Built as a private course for the Earl of Dunraven by the Scottish professional Ben Sayers in 1898, the club opened in 1900 but was not affiliated to the Golfing Union of Ireland until 1932 as the earl and his guests at the nearby gothic manor enjoyed the beautiful nine-hole course. 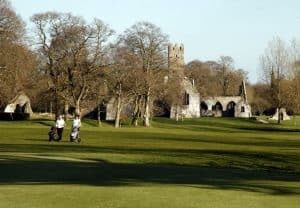 The members have owned it for many years, and they truly appreciate the great beauty of the site with its cemetery threatening the drive on the par-four 18th and the ruins of 12th century Desmond Castle and those of the Franciscan Abbey, founded in 1464, making it a unique and historic place to enjoy the great game. The club boasted a modest but still challenging nine-hole course until 1992 when pressure on its limited resources began to tell, and a move to extend to 18 holes got underway. The expansion plans met with some well-intentioned resistance, and many were saddened to see the old nine-hole course transformed. However, Eddie Hackett weaved his magic on the small parcel of land and the course, while tight, now measures 5,807 yards from the tips. A par 69 with six par-threes, two par-fives and ten par-fours, it’s short by modern standards. But with its holes wending their way through the trees and with strategic bunkering and streams waiting to gobble up errant shots, it’s a course that every Irish golfer should play at least once. It’s a testament to the strategic challenge that when Royal Dublin’s Niall Kearney won the first of his two Irish Professional titles there in 2014, he was one of just six golfers in the field to break par, carding rounds of 70, 69, 63 and 66 to win by one stroke from Michael McGeady on eight under par. Those curious for a glimpse of the world famous neighbouring resort will be rewarded on their visit to Adare’s sylvan setting. And they are assured of a warm welcome at what remains one of the strongest members’ clubs in Limerick. “The terrain we have is very much the same as our neighbouring course, which really is magnificent,” confessed club chairman, John O’Gorman. “We have the castle, the monastery and the graveyard inside our course, which is something you don’t get in many places. John Wesley, founder of the Methodists, is believed to have preached under an ash tree near the 14th green and the connection is maintained to this day. Uniquely, on the first Tuesday in June each year, the course is closed to accommodate a Methodist Field Meeting which celebrates in bi-centenary this year. Of course, Adare Manor will forever be associated with the late Jackie Harrington, who won the Irish Amateur Close title in 1979, beating Mark Gannon in the final at Ballybunion. Winner of the Munster Boys title in 1952 and 1953, he made the first of 38 appearances for Ireland in 1958 and was a member of the six-man Irish team that contested the European Amateur Team Championship in Killarney in 1975. Winner of the Irish Open Senior in 1999, multiple scratch cups as well as two Irish Senior Cups, a Barton Shield and the European Club Cup with Limerick Golf Club, Adare Manor remained an integral part of his life until his death in 2011. It retains its old world charm, and it’s easy to conjure up a picture in the mind’s eye the fifth Earl of Dunraven, Colonel Wyndham Henry Wyndham-Quin, enjoying the beauties of the course with his aristocratic guests. While the club was not affiliated to the GUI until 1932, it was run as part of the Dunraven Estate Company with the subscription kept at two guineas for many years with the modest fee including lunch (with suitable wines from the well-stocked cellar) at the Manor twice a year. Since those far-flung days, the club has gone on to achieve notable successes on the inter-club scene with the 1985 Pierce Purcell Shield and the 2014 JB Carr Trophy its biggest All Ireland successes. The club celebrated its centenary in 2000 when the 7th Earl, Thady Windham Thomas Wyndham-Quin, was President. A sculpture, fashioned from 5,000-year-old bog oak, was erected at the back of the 18th green to commemorate this special occasion and a time capsule, which will be resurrected for the club’s 150th anniversary in 2050, was buried at its base. The club continues to strive for excellence, reaching the final of the Irish Mixed Foursomes 2017, where they fell 3-2 to Tullamore after a nail-biting contest, and there are high hopes for further successes.